Are your teeth preventing you from enjoying your favourite ice cream or having your hot chocolate??? HOW LONG DOES IT LAST??? Symptom: Sensitivity to hot or cold foods that comes and goes? Does the discomfort go away immediately? Possible problem: This may be caused by a small decay, a loose filling or by minimal gum recession that exposes small areas of the root surface. What to do: Visit your general dentist and he could point out to what could be the cause of the discomfort and advice you your options. 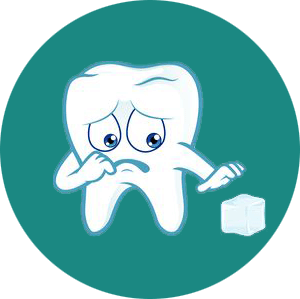 Symptom: Sensitivity or tooth pain lasting more than 30 seconds, after eating hot or cold foods. Possible problem: This probably means the nerve and blood vessels inside the tooth has been damaged. What to do: Visit your general dentist and after he takes an X-ray of the tooth and runs a couple of tests he can tell you if the tooth can be saved or not. If the tooth can be saved, he will either offer you a replacement filling or a (root canal treatment). Symptom: Sensitivity to hot or cold foods immediately after dental treatment. Possible problem: Dental work may cause some amount of inflammation/ irritation to the nerve and blood vessels inside the tooth. What to do: Wait two to four weeks. If the pain worsens during this duration, see your general dentist, this means the tooth may require further work.